1.Klik pada ikon bintangr () dengan address bar browser Anda. 2.Pada kotak prompt, pilih "Bookmarks Bar"
NM Rice / PHSL-Pemupukan Hara Spesifik Lokasi Padi Sawah di bookmark bar. 2.Klik pada ikon bintang () dengan address bar browser Anda. 3.Pada kotak prompt, klik "Hapus"
Penggunaan situs baru akan memungkinkan diakses offline dan digunakan. Layanan Konsultasi Padi is designed for use by extension workers, crop advisors, input providers, and providers of services who interview a farmer using a computer or smartphone. After the interview, the collected information is stored on the computer or smartphone until the Web browser is connected to the Internet. Collected information is then transmitted via the Internet to the Layanan Konsultasi Padi 'model', which calculates and transmits a crop management guideline back to the computer or smartphone. Each guideline provides an actionable recommendation, which matches the location-specific cropping practices and needs of a farmer. The guideline is provided to the farmer as a one-page printout and in some cases by SMS to the phone of the farmer. 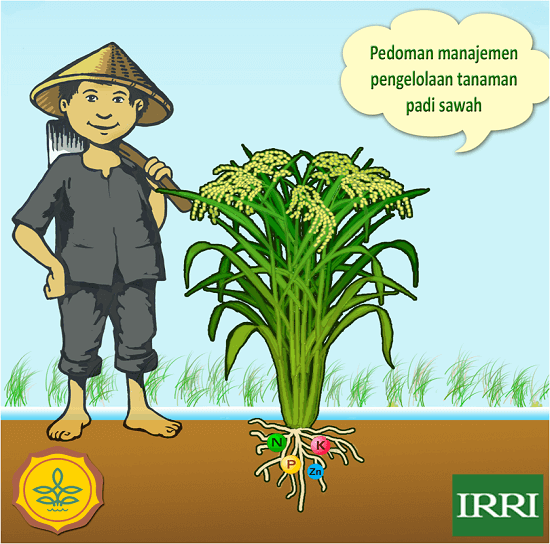 Layanan Konsultasi Padi was developed from Nutrient Manager for Rice (Pemupukan Hara Spesifik Lokasi [PHSL] Padi Sawah). The following organizations contributed to the formulation and field evaluation of Nutrient Manager for Rice (PHSL), which is the precursor to Layanan Konsultasi Padi and provides the nutrient management component in Layanan Konsultasi Padi. Fairhurst T, Witt C, Buresh R, Dobermann A (editors). 2007. Rice: a practical guide to nutrient management. Second edition. Los Baños (Philippines): International Rice Research Institute and Singapore: International Plant Nutrition Institute and International Potash Institute.Click here to view the publication. The International Rice Research Institute (IRRI) does not endorse or promote specific agricultural inputs and fertilizers, and it does not guarantee the accuracy of an analysis labeled on commercial agricultural input and fertilizers. The software assumes that the N, P2O5, and K2O analysis labeled on a bag of fertilizer or organic material accurately reflects the content of plant nutrients. Many factors beyond the scope of Layanan Konsultasi Padi—such as climate and water availability—affect rice yield. IRRI does not guarantee a targeted rice yield will be attained with the provided crop management guidelines. The content of the software is subject to change without notice. Under no circumstances and under no legal theory, whether tort, contract, or otherwise, shall the Board of Directors of the International Rice Research Institute (IRRI) or any of its affiliates, officers, employees, or other representatives be liable to you or any other person for any direct, indirect, special, incidental, or consequential damages of any character including, without limitation, damages for loss of goodwill, work stoppage, computer failure or malfunction, or any and all other commercial damages or losses, specifically including damages to crops and soil resulting from the application of the software, or for any damages or liabilities even if IRRI shall have been informed of the possibility of such damages or liabilities, or for any claim by any other party. This limitation of liability shall apply to liability for death or personal injury except to the extent applicable law prohibits such limitation. To start, select on a language (Bahasa Indonesia or English). If it is your first time to access the Layanan Konsultasi Padi, this will be the first page you see. If not, you can access this with the button, located on the bottom left of the page, then click on Language. Answer questions for the farmer's field in the order that they appear on the screen. A field could be one parcel or several parcels with similar management, variety, and soil fertility. Select an answer from a list of choices by clicking or ticking, or typing the answer into the provided box. Use the scroll bar on the right side of the page with questions to go back to a previous question. After all questions have been answered, click on the button that will appear on the bottom right of the page. If online, a recommendation page with the crop management guideline will be generated. This guideline is based on the answers to the questions. If offline, the user will be asked to save the collected information. The collected information will be saved as a pending input file. When connected to the internet, click on the button, click on the Pending input files folder then select the file to generate the recommendation. The recommendation page typically provides a guideline for an attainable yield level higher than the yield previously attained by the farmer. The yield level is estimated as attainable with good agronomic management practices for the given variety, season, and location. For desktop or laptop computer: Click on the button below the recommendation page. For smartphone: Save the recommendation in the phone as an image. Connect phone to a computer connected to a printer. Find the image from the Gallery or File folder and then print. To start developing a new recommendation, click the button and select Start new session. The questions used in Layanan Konsultasi Padi for interviewing farmers are available as a downloadable questionnaire, which can be printed. The printed questionnaire can alternatively be used to interview farmers. The information collected with a questionnaire can then be entered into Layanan Konsultasi Padi to obtain a guideline for the interviewed farmer. Click on a language below to download questionnaire. Warning: You can only input up to 10 fields. For how many rice fields do you desire a recommendation? Answer the following questions for your field number. What is the size of the field? Warning: Enter a value not greater than 11 hectares. What crop was grown before the ? How will your rice be established ? What will be the transplanting method in the upcoming ? What will be the plant spacing in the field in the upcoming ? What is the source of your rice seeds in the upcoming ? Ent var1 for in the with no pest or disease. Bila var2 for with no pest or disease. Ent var2 for in the with no pest or disease. Bila sebelum dipotong bawon untuk var2. Is the rice biomass standing after harvest, cut or removed for other uses? How is rice straw managed after combine harvesting? How is residue from the preceding corn crop managed? Do you apply insecticide within ? Will you synchronize your transplanting within 1 month with that of your neighboring fields ? Did you lose more than 1 t/ha yield from brown plant hopper in the in the last year? How much is the intensity of damage due to stem borer in the in the last year? Based on past experience, is rat damage common in ? Based on past experience, how often is the loss of yield due to flooding or submergence of the rice crop at 15 to 40 days after transplanting? How much organic material will you apply for yourhecfie? Did you answer the questions through an interview of a farmer who wants to receive a recommendation? What is the total land area of the farmer group where rice is grown? Have you received an LKP recommendation in a previous season? Do you reside in Indonesia? Note: Use this recommendation for (selected) season yearonly. Use new certified seed each wet season. Use Inpari 13 for resistance to BPH. Yield could be 10% lower than Ciherang in absence of BPH. Use submergent tolerant varieties like Inpara 3, Inpara 4, Inpara 5 or Inpari 30. Use submergent tolerant varieties like Inpari 30. Use higher plant population through 20cm x 20cm square planting or legowo. Reduce risk in rat damage through legowo. Do not apply insecticide within 30 DAT (or 40 DAS/DAE). Plants compensate for early dmage caused by defoliators; no spray also conserves beneficial organisms. Plow and flood rice field as soon as possible. Cover nursery with a net to keep out insects. Plow and flood rice field as soon as possible. The new yield target must be realistically attainable with the variety, crop management and expected climate conditions. Indicate new yield level within the range of xxxx kg to xxxx kg. Do you want to send the fertilizer recommendation? Do you want to save the fertilizer recommendation? Note: Once the recommendation has been shared or saved, changes in the yield level, fertilizer source, and answers provided on the questions will no longer be allowed. Do you want to store the collected information for field of ? The collection of information for parcel is now complete. The information is stored on your device. The collected information for parcel of will be deleted. There will be no recommendation to be provided. You have now successfully ended your session. You may now close this browser window.